Pioneer has launched its new range of touch screen AV players. The AVH-X5890BT touch screen head unit is priced at Rs. 29,990 with a 17.8cm wide touch screen with an LED backlight display. It also comes with AUX input, USB port, and is compatible with smartphone apps. The player is equipped with Pioneers own AppRadio mode technology which is compatible with iPhone and Android phone. Applications that are compatible with AppRadio mode include Navmii, Navitel, EC Touch, and AppRadio live. The AVH-X5890BT can be connected to two Bluetooth devices simultaneously and also features Siri voice control. Other products launched by Pioneer include AVH-X2890BT, AVH-189DVD, AVH-289BT, and AVH-X1890DVD. 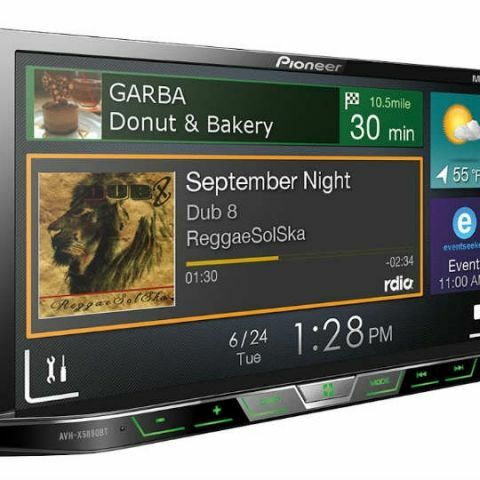 Pioneer India, the leading in-car entertainment systems company, today unveiled its new range of touch screen AV players. The company launched its latest touch screen head unit AVH-X5890BT for Rs. 29,990 which features 17.8 cm wide touch screen with LED back light display, AUX input, USB port, Smartphone apps compatibility, Built-in Bluetooth, Siri Voice control (through Bluetooth) and offers 2 year warranty. AVH-X5890BT comes with Pioneer’s unique AppRadio mode technology which is compatible with both iPhone and Android phone. With AppRadio mode, compatible navigation & music apps can be viewed and controlled directly from AV player’s touch screen. AppRadio can be easily connected by plugging in the phone with its original data cable. Some of the compatible applications with Pioneer AppRadio mode include Navmii (Offline navigation app), Navitel (Navigation app with detailed map data), EC touch for accessing smartphone’s music & AppRadio live for online services like checking weather information, finding nearby events, accessing internet radio, News reader etc. With AVH-X5890BT touch screen, two mobile devices (Main + Standby) can be connected simultaneously using Bluetooth. Its Bluetooth Wireless Technology enables users to enjoy music playback & Siri* voice control on an easy to use Pioneer interface without using any wires. AVH-X5890BT is also compatible with the steering wheel mounted audio controls of most of the popular cars in India. AVH-X5890BT not only makes connectivity easy but also helps to improve the listening experience. It supports FLAC files and uses Advanced Sound Retriever technology that improves the sound quality of compressed MP3 files. It also has Time Alignment mechanism which estimates the delay of sound from each speaker to driver’s position and adjusts speaker’s output timing, so that the sound from all speakers reach the driver’s ears in perfect sync. It also features a 13 band equalizer and a Todoroki Equalizer which is specially designed by Pioneer audio engineers keeping Indian music in mind. For a non-stop music experience, users can use the Mixtrax feature which creates non-stop MIX experience with technology based on Pioneer's history of innovative professional DJ product development. Other products launched by Pioneer India Electronics Pvt. Ltd include AVH-X2890BT, AVH-189DVD, AVH-289BT, AVH-X1890DVD. is digiflip touch screen is Capacitive?